Temporomandibular syndrome is an umbrella term for conditions that cause pain or dysfunction in the jaw joint and face. 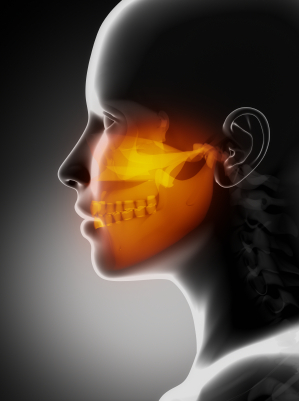 The temporomandibular joint (TMJ), the muscles of mastication (chewing), the associated connective tissues, or all of these structures may be involved. The TMJ is a “ball-and-socket” joint. The mandibular condyle forms the ball; the socket is formed by the glenoid fossa, which is a hollow at the base of the cheekbone; a cartilaginous articular disk forms a cushion between the condyle and the roof of the fossa. This disk is donut-shaped with a tough membrane stretched over its hole. In some cases Temporomandibular syndrome TMJ is the result of a medical problem: joint inflammation due to infection or rheumatoid arthritis, for example, or unbalanced jaw motion due to missing or misaligned teeth or jaw maloclusions. These instances require a physician’s care and sometimes even surgery. In our practice, we have found that TMJ syndrome often turns out to be stress-related. Individuals may clench their jaws or grind their teeth, causing the jaw to become painful or even lock. Relief of stress can be optimized with certain foods, supplements, massage and exercises. How do you know it’s Temporomandibular syndrome? Several conditions can mimic Temporomandibular syndrome, including ear infection, sinusitis, toothache, trigeminal neuralgia, post-herpetic neuralgia, temporaral arteritis or otitis media (ear infection). These conditions must be ruled out before a diagnosis of TMJ syndrome is made. If you are clenching your teeth due to emotional stress, make time for relaxation. Try to keep your upper and lower molars slightly apart, or barely touching. Wear a splint (available from your dentist) if you need to break the habit of grinding or clenching your teeth and keep a record of the times when you tend to do it. If you grind your teeth at night, use a mouthguard to prevent it. Avoid all screens (TV, computer, phone) at least one to two hours before bed so that your body knows it’s night time and time for bed (electronics confuse the body’s internal clock, creating stress and disturbing sleep patterns). Eat slowly, cutting food into small bites. Apply soft ice packs to the painful jaw area. AVOID HARD FOODS. Foods such as apples, bagels, corn on the cob and chewy candies can throw your jaw joint into a lock. Do not chew gum. Avoid holding the phone between your head and chin. Don’t wear a heavy purse or bag that can throw your body alignment out of whack. Acupuncture and biofeedback have been known to help with pain relief. Don’t sleep on your stomach, which puts pressure on one side of your face and can push your jaw joint out of alignment. Using a cervical pillow can encourage sleeping on your back and promote the relaxation of jaw muscles. In certain traditional societies, people slept on their backs, with their heads elevated and tilted slightly forward. This was intended to keep the jaw softly closed to discourage mouth-breathing, and it also helps keep the neck, back and jaw relaxed. Some of our clients have found complete TMJ syndrome relief when combining our suggestions with a deep form of massage (such as Rolfing) that manipulates the fascia (connective tissue), thereby releasing past trauma and allowing the muscles and bones to return to proper, balanced alignment. This kind of manipulation addresses the WHOLE body and is best done in a series, but even one or two sessions is helpful. Thus, without sufficient magnesium in the body, not only can TMJ Syndrome result, but feelings of stress and anxiety are exacerbated — resulting more jaw clenching or teeth grinding. Magnesium also requires calcium to work properly, so addressing deficiencies in both areas is very important. As with many other dietary plans, we recommend low-glycemic organic fruits and vegetables, raw dairy, goat yogurt and pastured meats, bone broths and wild caught fish. Putting nettles (they don’t sting once they’re cooked!) in your bone broth or soups will raise the calcium and magnesium levels even more. Calcium-rich foods include raw dairy, pastured butter, sardines, herring, wild-caught salmon, chickpeas, apples, avocados and leafy greens of the cabbage family such as kale, mustard greens, and turnip tops, and bok choi. *Consuming adequate pastured animal protein (such as pastured beef and lamb) is very important for calcium absorption. Studies conducted by researchers at the University of Connecticut showed that consuming more protein increased calcium absorption from the intestines. Magnesium-rich foods include sprouted almonds, walnuts, sunflower seeds, pecans, brazil nuts and cashews, blackstrap molasses, sprouted tofu, collard greens, raw dairy, avocado, millet, prunes, beets and parsley. Avoid stimulants as much as possible: caffeine in particular. Refined sugars and flours can cause vitamin and mineral deficiencies that heighten tension and anxiety. One study found that glutamate evokes immediate pain in the healthy human TMJ that is partly mediated by peripheral NMDA receptors in the TMJ. If glutamate is playing a role, then raising GABA through the precursors may bring relief. These include magnesium, folate, vitamin C and zinc. Magnesium is notoriously low in food, and supplementation is needed to achieve adequate levels in the body. B-vitamins are best taken as a complex for optimal balance and absorption. Vitamin C should be taken in a dose of 1,000-1,500mg 2x a day.